The Camp Grafton Society AGM was held on Wednesday February 6. Looking back over 2018 and looking ahead to 2019 and beyond, are both very positive outlooks. The 2018 camping season was very successful with full camps and wait lists. By February 6 of this year, our registrar reported that there were only 13 available camper spaces for 2019, and she has been the recipient of many desperate messages from youth who find themselves already on wait lists for their preferred camps this summer! In 2018, the amount of campership support disbursed to campers in need was greater than the donations received for that purpose. The Camp Grafton Society board is pleased to be able to do this, but as we embark on some ambitious and very necessary upgrades, we are mindful that there will be an increased need for the generous support of others for camperships and for capital improvements. A highlight of the AGM was the opportunity to view some renderings of the proposed kitchen upgrade. There is a good energy on the board for moving forward with fundraising and planning for the septic system upgrade (which must come first), and then the kitchen and eventually the ablution center. In the shorter term are plans for some smaller cabins that can shelter staff and/or overflow campers. We are fortunate to have again in 2019, siblings Jason and Sarah Marchese sharing the role of Camp Coordinator. Our coordinators are accepting applications now for 2019 staffing. 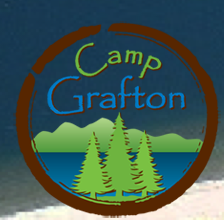 You can follow Camp Grafton on Facebook, Instagram, or visit the website.